Most gardeners are aware of the traditional combi- nation of asters and goldenrods for fall color in Sep- tember and October but how many realize that rep- resentatives of these two groups actually begin their color display in late summer? Instead of languishing from the summer heat and humidity, several early flowering species are gearing up for prime time, their performance often lasting a month to six weeks. Along with their companions, they link one season to the next and provide a color display that entices us to once again explore our favorite garden haunts. The following perennial plants are ideally suited for meadow or edge-of-woods plantings where their growth habits and vigor cre- ate masses of textural interest and their flowers provide seasonal color among more verdant vegetation. Sun-loving species make perfect associates for meadow grasses and denizens of shady habi- tats mingle well with ferns. Two white-flowered asters that bloom in August include the flat- topped white aster (Doellingeria umbellata) and the white wood aster (Eurybia divaricata). The flat-topped white aster flowers prolifically on rigid, upright stems, often beginning as early as late July. Each 3”-8” wide, flat- topped cluster is comprised of numerous small white flower heads about 3⁄4 ” in diameter. They fade to a pleasant greenish or cream color after bloom. The 6” long, lance-shaped leaves are resistant to disease and the foliage is sufficiently handsome to remain orna- mentally attractive after the plant flowers. Flower heads attract bees, wasps, butterflies and other insects in search of nectar and pollen. Flat-topped white asters are rhizomatous and grow well in full sun to partial shade in moist to average, slightly acidic soils. Although typically growing to 5’ tall, they can be cut back to half their height in June, to encourage branching and reduce their ultimate height. The showy, 3⁄4” wide, white flower heads of flat- topped white aster are arranged in a broad, flat- tened cluster. The vigorous white wood aster is a spectacular woodland groundcover that thrives in dry shade. It blooms from Au- gust to late September producing clusters of delicate, 1” wide, white, daisy-like flowers with yellow or red centers on slender 1 1⁄2’ – 2 1⁄2’ slightly zigzagged, green to black stems. Its heart-shaped leaves with serrated edges have few insect or disease problems. White wood aster is easily grown in partial shade to shade in neutral to slightly acidic, well-drained soil. It requires mini- mal maintenance except to encourage branching by cutting back the stems in early spring. An excellent groundcover for sunny sites is Golden Fleece autumn goldenrod, (Solidago sphacelata ‘Golden Fleece’). Begin- ning in late August, this carefree, long-lived, compact form of the species will delight you with 15”-18” long arching spires covered with tiny clusters of golden-yellow flowers. Its multi- branched stems arise from basal rosettes of broadly rounded foliage. Golden Fleece autumn goldenrod performs best in full sun with average moisture but will tolerate partial shade and hot, dry sites. Non-aggressive, long-lived and carefree, it is attrac- tive to hummingbirds, bees and butterflies as well as a good cut flower. Blooming at the same time as these early asters and golden- rod, the following species are easily grown and reliably return year after year to provide late summer color. An ideal choice for moist to wet fertile acidic soil in full sun to partial shade is the great blue lobelia (Lobelia siphilitica). It is an erect, 2’-3’ tall, clump-forming plant with showy termi- nal racemes of light to dark blue-violet tubular flowers with five prominent, spreading lobes. The stems, which usually remain unbranched, are covered with alternately arranged, irregularly toothed, lance-shaped leaves up to 5” long. Great blue lobelia has a long bloom period. Flowering begins in early August and extends into fall. 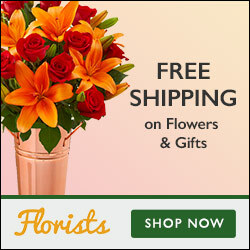 Flowers attract bumble- bees, hummingbirds, and butterflies. Plant more than one; it is enjoyable to discern the slight difference in blue flower color. 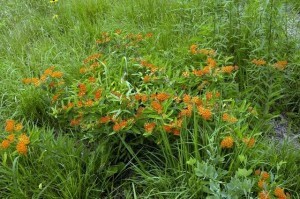 Sited properly, butterfly weed, (Asclepias tuberosa) , is a hardy, long-lived, 2’-3’ tall perennial with spectacular flat-topped clusters of typically brilliant orange flowers, but flower color can range from yellow to dark red. Flowering begins in July and extends into September. ‘Hello Yellow’ is a popular yel- low flowered form of butterfly weed. The 3”-4” leaves are lance-shaped, hairy, and arranged alternately on the stem. Full sun and well-drained soil are keys to success with but- terfly weed, although light shade is tolerated. Rich soils that retain moisture should be avoided as the roots are subject to rot under those conditions and mulching is not advised. It has a long taproot and does not move easily so plant in a permanent location. The ornamentally attractive 4”-5” long seed pods split on one side to release numerous silky, plumed seeds. Butterfly weed is a striking plant whether planted individually or in groups with other sun-loving plants especially those that thrive in hot, dry situations. Butterflies and hummingbirds are frequent visitors and cut flowers make long lasting arrangements. Mistflower or wild ageratum, (Conoclinium coelestinum) pro- duces showy flowers for up to six weeks, from late August through September. The terminal, flat-topped, 1”to 3” wide, soft blue-violet flower heads are comprised of tubu- lar florets and have a fuzzy appearance similar to annual ageratum. The long slender stems, 1’ to 3’ tall, hold broadly lance-shaped, opposite leaves that are coarsely toothed. Wild ageratum has a tendency to spread by rhizomes to form solid colonies in moist soils. This can be a desirable attribute in meadows where large scale drifts are important. In more restricted spaces, prune back for bushiness and to keep it in bounds. It grows well in light shade to full sun in fertile, moist, slightly acidic soil. It attracts bees and butter- flies and makes an outstanding cut flower. Garden displays in late August and early September need not represent an exhausted end to a long, hot growing sea- son. You can plan ahead by selecting plants that are vigor- ous, require minimal maintenance, and are well adapted to their sites. They will make a welcome transition to the joys of the garden in autumn. Jeanne has worked at Mt. Cuba Center for the past 21 years and is currently the horticultural research manager. Her responsibilities include native plant propagation and production research. Jeanne has authored several horticul- tural references including Asters in the Mid-Atlantic Region and Trilliums at Mt. Cuba Center, A Visitor’s Guide.